How did you end up as a coffee-roaster? I worked at Starbucks for a few years, then discovered the larger world of independent specialty coffee when I moved to southwest Virginia and started working at a newly opened local shop. There, I met Haden Polseno-Hensley, the co-owner of Red Rooster Coffee Roaster, a small, young roasting company that was providing some of the beans we used. Haden soon realized that growth was happening faster than he could keep up with on his own, so he offered me a job. It’s an unending journey of learning, which sounds sort of like a cliché, but is totally true. There are so many approaches to the craft of coffee roasting. I also love that there are constantly new coffees to try. And I love the people. It’s an industry largely made up of innovators, full of empathy and the desire to do what’s right. What do you look for in a good green coffee? What’s your favorite coffee these days? In a washed green coffee, I’m looking for a uniform color with minimal broken beans. In a natural green coffee, I expect to see some variation, but I’ve found that the best ones (typically from Ethiopia) have minimal difference in color. As for my favorite coffee these days, it’s impossible to pick one. We’ve had some great coffees from the Huila region of Colombia in the past year, and currently have the Colombia San Adolfo, which is from trees of the Pink Bourbon variety. I also love washed Ethiopia, and we have the latest offering from the Hambela Estate (along with the natural, which is great). 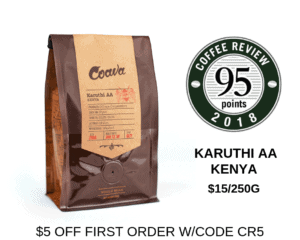 Finally, I love Kenya coffees (who doesn’t? ), and we currently have the juicy, sweet and delicious Kenya Kiamabara. Do you have a favorite machine you like to work with? I can’t really say I have a favorite. We currently have a five-year-old Ambex YM-15 and a more than 20-year-old year old Diedrich IR-12. I appreciate the Ambex because it’s what I learned on. I didn’t find it to be the easiest machine to jump on as somebody new to the trade. There was a lot of trial and error at the beginning, and a lot of uneven, speckled batches. Slowly, though, I learned the nuances of the machine, and of coffee-roasting in general. I’ve gotten to a place where I can produce consistent, well-developed roasts. I appreciate the Diedrich for its ease of use. The lack of a direct heat source on the drum helps to minimize surface burning on the bean, producing very even roasts. What is the most challenging coffee you’ve ever roasted, and why? A natural-processed (dried-in-the-fruit) Honduras coffee from the COMSA cooperative, when we first started buying it a few years back. We only had our Ambex at the time, and the direct flame on the single-walled drum proved very tricky with such a finicky coffee. I learned pretty quickly that it needed a gentle touch, so I began reducing my batch sizes and dramatically reducing the heat I applied, especially around first crack, until results improved. What are the trends you see in coffee right now? Which ones do you think will last? One major trend that I’ve noticed in the coffee world is a shift toward the middle in roast level. I love lighter-roasted coffees, but I’ve always been keenly aware that not everybody does. Working in a very rural community where every customer counts, taking a hardline stance about roast level has never been an option. As a result, we, at Red Rooster, have always prided ourselves on being a full-service roaster and offering the full range of roast styles. That said, I think we’ve changed a lot of people’s perceptions of what coffee can be by constantly seeking out better and better coffees, and improving our skill in roasting, brewing and presenting them new coffee experiences in a down-to-earth way. Ultimately, I think it’s about accessibility and education, and I think that will be a lasting trend. How would you describe the third wave of coffee, and do you consider yourself a part of it? The third wave coffee, to me, is a constant, evolving pursuit of quality. It’s a movement that has taken elements of the first and second waves and has elevated them with new ideas of what coffee can be. While I think the industry can take itself a little too seriously sometimes, ripe with material for a Christopher Guest feature-length film, I think its heart is in the right place. I don’t mean that last statement as derogatory, so much as an awareness of the fact that some folks view the industry as exclusive and haughty. At Red Rooster, we do consider ourselves a part of the third wave in our pursuit of learning and the next level of quality. An equally important part of the puzzle for us is to conduct ourselves with humility, and to hold to the idea that the world of coffee is an inclusive, welcoming place. Where do you think the coffee industry will be in 10 years? I think the major focus of coffee is and should be addressing climate change, so I think the industry will be much more sustainable in 10 years. Alternative processing methods that use less water, like honey and natural, will continue to improve and become much more prominent. Another issue that I think is of equal importance, and has been a focus in recent years, is improving wages in producing countries. I hope that cause will continue to advance in the next decade. What’s the best moment you’ve had with a consumer tasting good coffee for the first time? I can’t think of one moment in particular, but my favorite moment in general is when people experience a cup of really high-quality coffee and walk away saying it’s the best cup they’ve ever had. I realize they’ll probably have that experience again at some point, but I love seeing or hearing about the moment a person’s idea of what coffee can be is elevated. If coffee suddenly vanished, goodness forbid, what would be your second drink of choice? Beer! A great IPA or farmhouse ale.